The first ever, Richmond Hill Farmers' Market was held on Tuesday afternoon in the park. It was a great success according to the Market Manager, Angus McLeod. He wrote on the Market's Facebook page that no one expected to see around six hundred people turn out for the event. I say, Why in the world NOT? Many of my friends who live in Richmond Hill bemoan even the prospect of traveling all the way to Savannah. My reply is usually a very snarky, Well, its not like this is New York City. In the ten years I have resided in the Coastal Empire, venturing farther than the Bryan County line on one side of the Ogeechee River is a weekly occurrence for us. 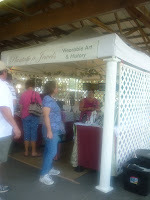 There was a great variety of products to see and buy. Artisan pasta from FraLi Gourmet... guess what I bought? Fresh baby bella Mushroom Ravioli. Surprise, surprise. Wild caught Georgia shrimp... right off the boat. I bought head on. I need to make some shrimp stock. Grass-fed Beef from Hunter Cattle Co. in Brooklet, Georgia. Savannah River Farms was also in attendence from Sylvania. Plantation Jewels was there selling beautiful and unique jewlery made from items recovered in shipwreck dives. Beyond chatting with friends, hugging many a sweaty neck, talking to the person who grew the produce I would have for dinner, I would have to say that my favorite thing was the fact that I would be back at my house in five minutes! Hope to see ya'll next Tuesday!